Feels like a really stupid question but will these work with the RGB Bulbs? No this is Bluetooth. Bulbs are wifi. A WiFi version or zigbee version could be a way more usefull ! I imagine they will be going towards Bluetooth Mesh technology. However considering the cost of that switch is nearly the same as Xiaomi gateway they could have included zigbee or wifi also. According to a response from them on Facebook, the Smart Dimmer Switch works with all WiFi bulbs! Anyone from Yeelight here in the forum could answer this question? Yeah, but above they said " [the wall swtich only for wifi ceiling lights, I’m afraid,". That’s the verdict then? the verdict is that no one should buy it. the clueless guy at Yeelight’s forum says that “the bluetooth wall switch supports all the wifi bulbs and no need of gateway”. at the same time… their own product’s advertisement says that it doesn’t support wifi bulb controls. i bet you that they will try to use your phone as a gateway or… make you buy their bedside lamp so that you can control that. also it looks like they don’t care much about Europe for sales since the backplate box is not compatible. it was a nice idea… VERY bad execution. These new dimmers replace Bluetooth remote that comes with every bt capable ceiling light so I believe these will be the only lights it will work with. I have both models on the way so will report when they arrive. To be fair he says lamps, not bulbs. But either he did not understand the question or he avoided the right answer on purpose. Anyway the switch is pretty useless, at least in Europe… The in-wall connector does not fit and the other version is just like the bluetooth remote… I see no advantages. I wonder if this is the switch we waited for… I mean it was like a year ago that they started talking about it… And this is it? 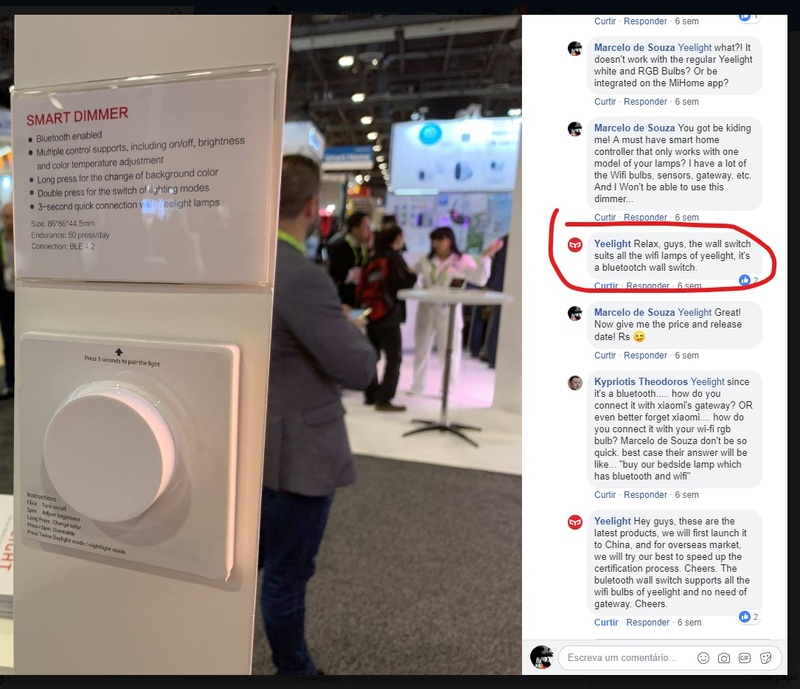 At least they could come up with a possibility to put it over the normal light switch but it is like their last products… No innovations, bad execution… Yeelight was in Pole Position with their V1 bulb but now I can buy better bulbs on every corner. The V2 problems with brightness are not fixed, high power consumption for Homekit support, that is not there. 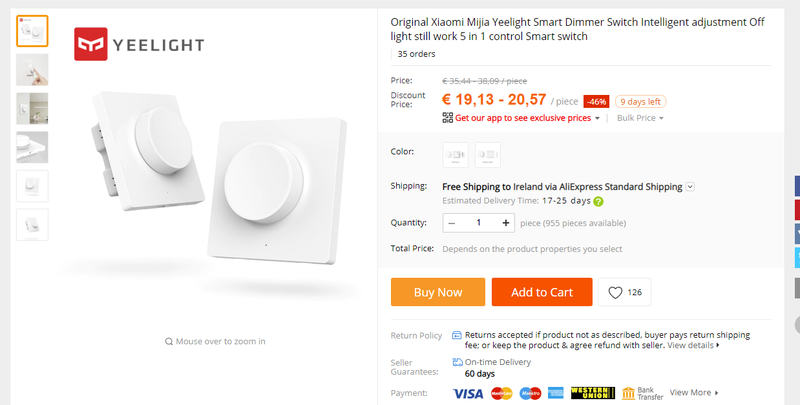 Aurora… A pretty boring overpriced lightstrip and now this switch… No wonder media talks more about a new Xiaomi Philips bulb under 10€ for Europe and no word about Yeelight. Hi, I’ve buyed two bluetooth/dimmer switches for yeelight ceiling light (the new product). First of all, it was very difficult to pair switch with ceiling light. The problem is the feature “auto on upon a power resumption”. To pair the switch you have to disable the feature, pair the switch and after re-enable (please update your guide with this fix). The second, and I’m very disappointed is that the change color with long press does not work, but the ceiling light is turned off. 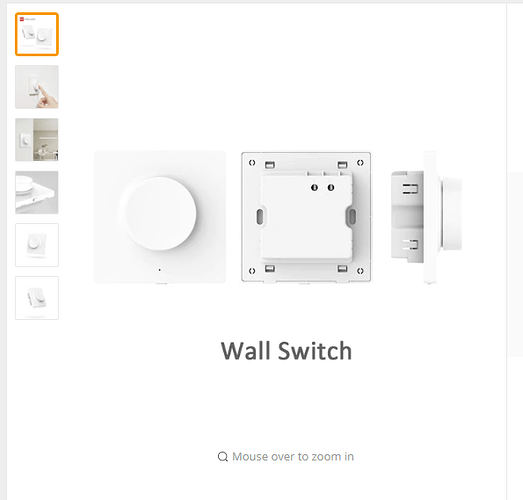 Have problem with pairing Yeelight Smart Dimmer Switch Wirelless. I push pairing button to 3 sec, orange LED will blinking. I turn on Yeelights 320 and nothing.